By the end of this month, the Federal Reserve will have completed its asset purchase program, bringing its second round of Quantitative Easing to an end. 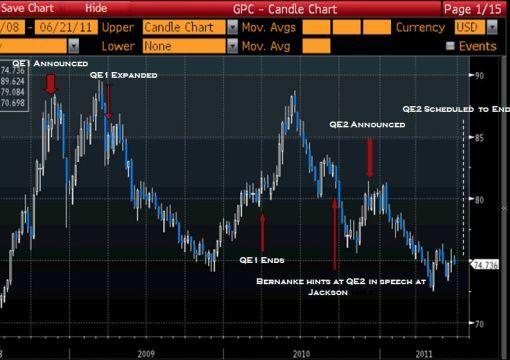 As QE2 draws to a close, it is worthwhile to consider how the dollar could react. When the first round of Quantitative Easing came to an end, we saw a massive dollar rally (see EUR/USD chart below). USD/JPY did not participate in the rally because of lingering concerns about the need for more stimulus (second chart). 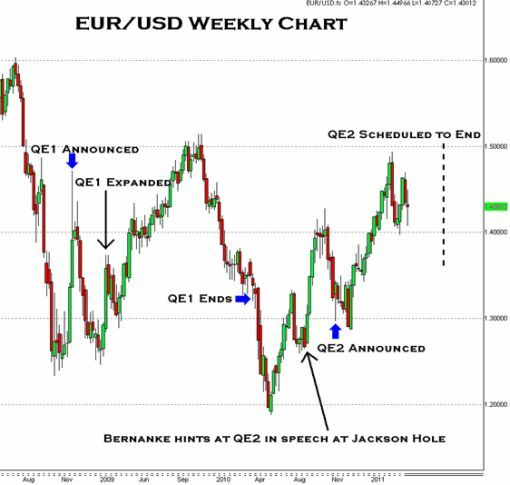 The dollar index on the other hand rallied as much as 10 percent as the greenback strengthened against high yielding currencies (third chart) – this suggests that once QE2 ends, we could see a more significant dollar rally. We had a number of surprises in U.S. economic data this morning including the Philly Fed index and leading indicators, but the biggest surprise was definitely the decline in continuing claims. Since the beginning of the year, continuing claims, which measures the number of people continuing to claim unemployment benefits rose week after week, forecasting the rapidly rising unemployment rate. 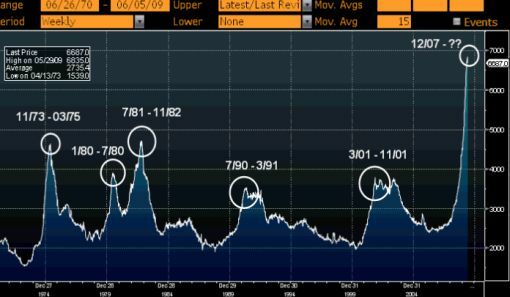 Initial jobless claims are important as well, but they can be noisy and volatile. There are 2 reasons why continuing claims has fallen – 1) people who have been on the unemployment rolls for a long time are falling off because they are no longer eligible for unemployment benefits 2) less companies are firing and more companies are hiring. I think that the latest improvement is a combination of both but regardless, a peak continuing claims always coincides with an end to the recession. In the following chart, I have highlighted the trend of continuing claims at the end of each U.S. recession over the past 3 decades. As you can see, claims have always stabilized or peaked at the end of the recession. The lag between the end of the recession and the official peak in claims has ranged from 0 to 3 months. In the past 30 years, there have been 3 recessions. The most recent lasted from March 2001 to November 2001, a period of 8 months. The one prior to that was in the early 1990s which lasted from July 1990 to March 1991. The current recession has been most commonly compared to the recession in the 1980s, which started in July 1981 and lasted until November 1982, a period of 14 months. We thought it would be interesting to see if there was a consistent trend in dollar after recessions and unfortunately based upon the limited data set of 3 recessions, we have found that the only pattern is the weakness of the dollar against the Japanese Yen 12 months after the recession. 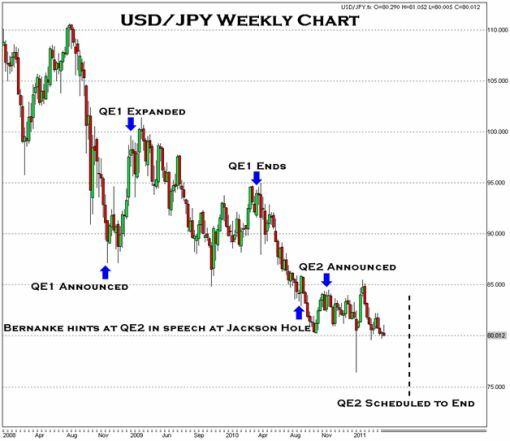 When the 2001 recession ended, the dollar traded higher against both the euro and Japanese Yen for the first 3 months but then gave back its gains over the next 8 months. In the 1990s, the dollar traded higher against the euro but lower against the Japanese Yen the first 3 months after the recession ended. The dollar fell further against the Yen but recovered its losses against the euro over the next 8 months. In the 1980s, the dollar fell in the first 3 months after the recession and continued to fall over the next 8 months against the Yen but recovered its losses against the euro. The US dollar is selling off aggressively ahead of Friday’s non-farm payrolls report on the fear that for the second month in a row, job losses may have topped 500k. The recent moves in the currency and equity markets suggest that everyone expects a very weak labor market report. Although the consensus forecast is -520k, the whisper number is closer to -650k to -700k. Sentiment is strongly skewed in one direction which can be dangerous considering the fact that some of the leading indicators for non-farm payrolls call for a rebound. The Non-farm payrolls report is the most market moving release for the currency market and it should live up to its volatility inducing reputation. For many Americans, 2008 has been a year unlike any other. Companies across the nation have been forced to tighten their belts and move into survival mode, accelerating layoffs towards the end of the year. With the December numbers, more than 2 million Americans will have lost their jobs in 2008. In fact, jobs were cut every single month last year. Although everyone expects very weak job growth, there is reason to believe that we may see a rebound in non-farm payrolls. First, the employment component of Service sector ISM, which is one of the most reliable leading indicators for non-farm payrolls improved in December along with the University of Michigan Consumer Confidence Index. 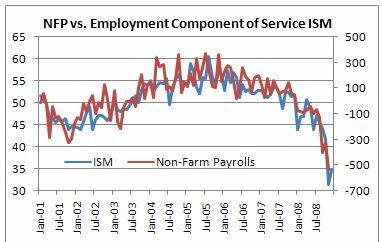 Since the US is a service based economy, the slower pace of job losses in the ISM report suggests that we could see a rebound in non-farm payrolls. In addition, every single time that we have seen non-farm payrolls fall by more than 500k, there is a steep rebound the following month. In the past 50 years, we have had 3 cases where more than half a million jobs were lost in one month and in every single one of those cases, NFPs rebounded close to 50 percent. The improvement in service sector ISM suggests that the rebound could be seen again in December. With that in mind however, non-farm payrolls will still be weak and the unemployment rate will rise as all of the leading indicators for non-farm payrolls point to more job losses. The main reason why the whisper number is around -650k to -700k is because private sector payroll provider ADP reported that 693,000 jobs were cut last month. Given that non-farm payrolls came out worse than the ADP report every single month last year, this has led some people to believe that job losses in December could have been the largest in 5 decades. Unemployment rolls are also continuing to grow with the 4 week average of jobless claims and continuing claims at 26 year highs. Layoffs have risen 274.5% while online job ads have declined. Despite the rebound in the employment component of service sector PMI, the index remains in contractionary territory while the record low hit by the Conference Board’s report of consumer confidence offsets the improvement in the University of Michigan data. Concerns about the US economy are growing as the Dow Jones Industrial Average erases all of its year to date gains, taking the US dollar down with it. The rally that we have seen in the first few days of trading will be difficult to sustain with all of the weak economic data that we expect in this month. Although the US government has thrown a lot of monetary and fiscal stimulus at the US economy, we may not see the fruits of their labor until the second quarter at the earliest. There is a major risk of a sharp drop in this month’s non-farm payrolls, retail sales and fourth quarter GDP reports and only after we have seen the last of depression like numbers can we begin to see a meaningful recovery in the US dollar. This is a big week in the currency market with non-farm payrolls due for release on Friday. The leading indicators for the pivotal labor market report are coming in and the latest report suggests that in the last 2 months of the year, more than 1 million Americans may have lost their jobs. According to the ADP private sector employment report, 693k jobs were lost in the private sector last month. This was much weaker than the market’s -493k forecast and suggests that non-farm payrolls could have dropped by more than 600k in the month of December. Layoffs also rose 274.5 percent according to the Challenger report with the biggest declines seen in the financial sector. Unfortunately big job losses will probably continue with Alcoa and Intel announcing more layoffs. The only silver lining is the rebound in the employment component of the service sector ISM report, which tends to have a very strong correlation with the non-farm payrolls report. With that in mind, we believe that job losses last month will be closer to 500k than 700k. Either way, both numbers spell big trouble for the US labor market. Q4 will be one of the worst quarters for non-farm payrolls that this generation has ever seen which is why the US dollar is weak and may remain weak going into the NFP report. With no US economic data on the calendar today, the dollar weakened against every major currency except for the British pound. Trading continues to be very thin with commodities being the only products that are really moving. The tensions in the Middle East have driven oil and gold prices higher. US stocks also gave back Friday’s gains and remained contained within its weeklong trading range. Hopefully trading will get a little bit more interesting on Tuesday, when we have the CaseShiller house price index, Chicago PMI report and consumer confidence number due for release. Weaker economic is not a given. Although house prices are expected to continue to fall as homeowners and builders offer discounts to drive sales, we could see an improvement in the Chicago PMI report and consumer confidence. Manufacturing conditions in the Philadelphia region rebounded this month, which suggests the potential for a similar improvement in Chicago. Lower gasoline prices have also helped consumer confidence recover according to the University of Michigan’s report last week – the Conference Board’s report should reflect a similar shift in sentiment.